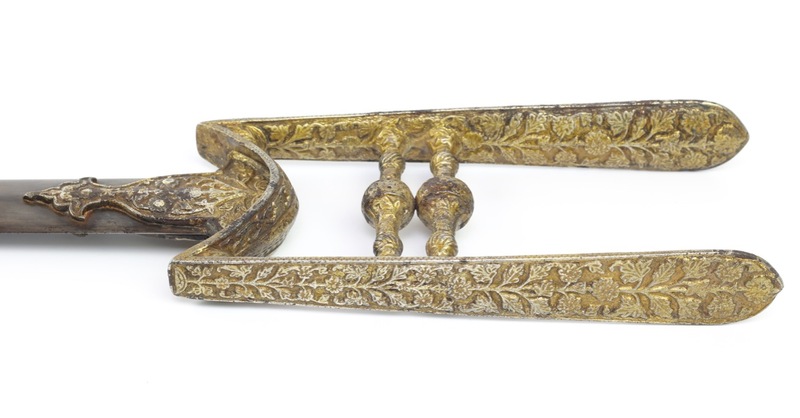 This fascinating piece has a handle that shows a completely different decor, depending on the side from which it is viewed. It is part of a small, extremely rare group of such katars I am aware of. I only know of two in private collections, none of the notable museums I am aware of have an example. 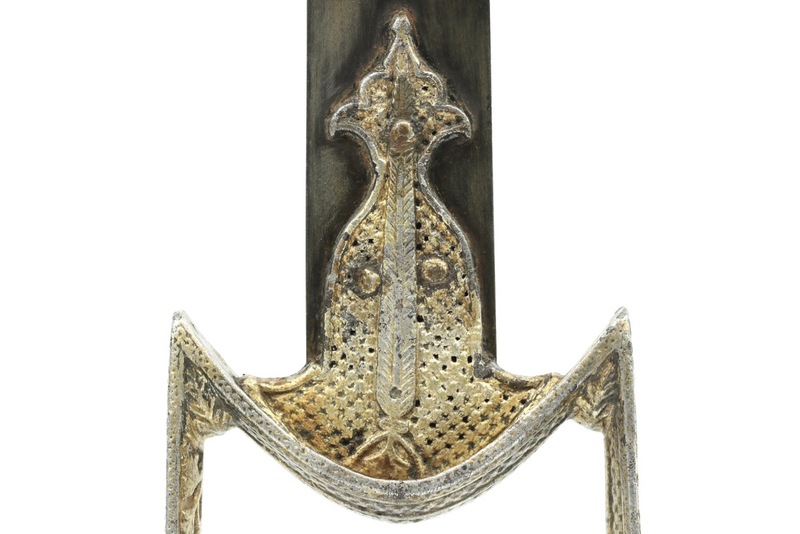 The decor on one side is a rather restrained geometric decor with a pierced background and "tree of life" elements running over each side-bar and the langet that holds the blade on one side. 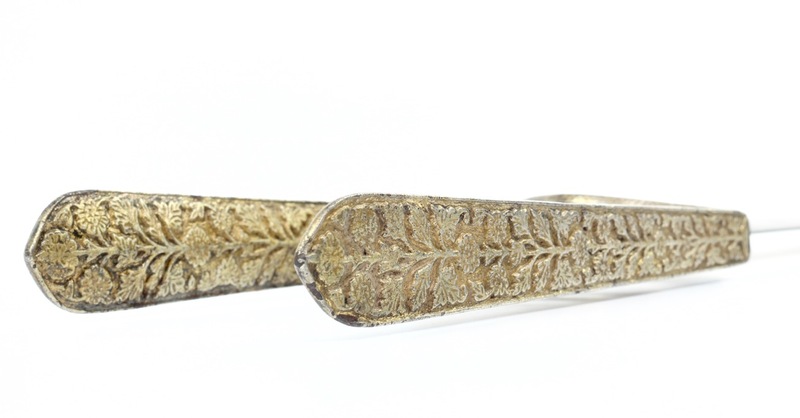 The other side shows a more flamboyant floral pattern, a series of leaves and flowers that all project from a single, long stem. The style feels very Deccan. The absence of Hindu iconography may attribute it to the Deccan Sultanates. 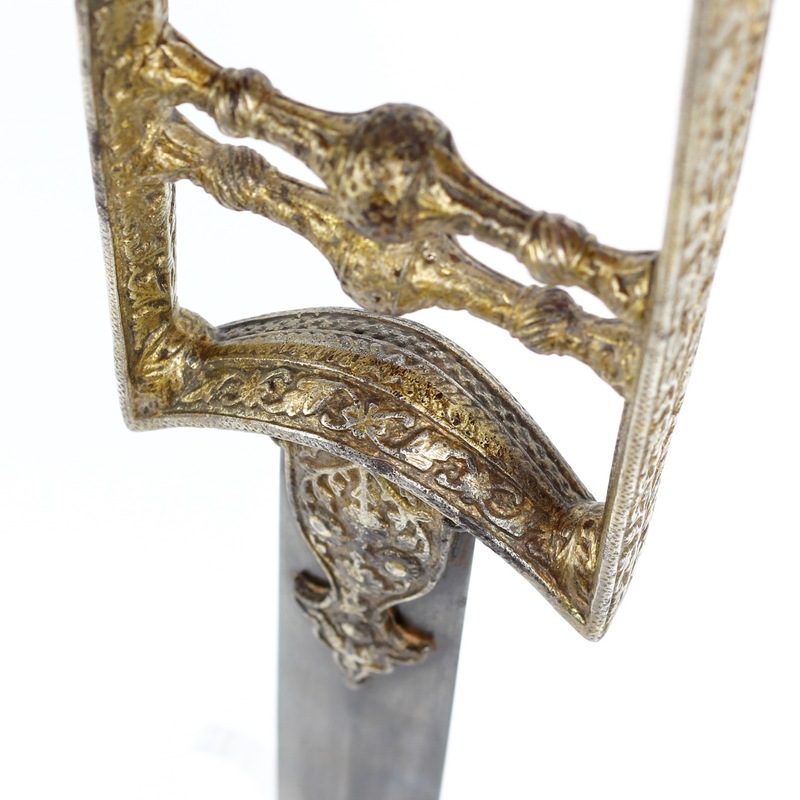 The handle is silver damascened in its entirety, and subsequently gilt. The surface covering is still largely intact, with only very minor losses. 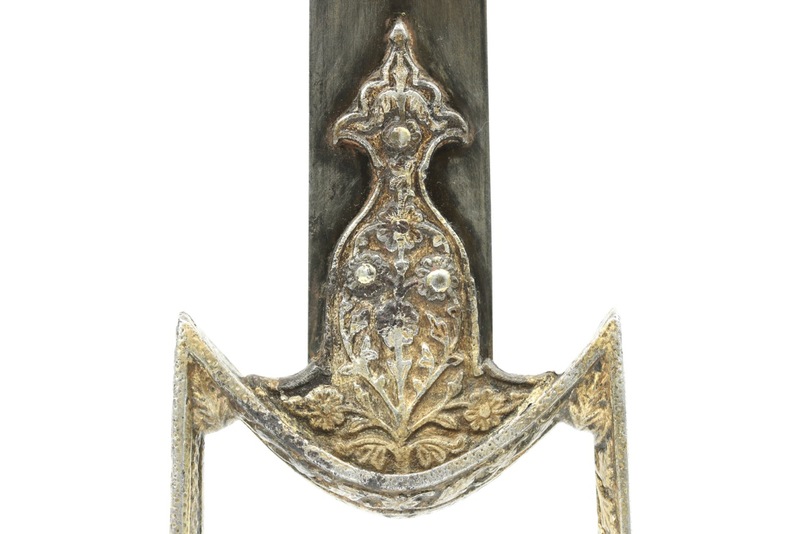 The thick use of silver and gold makes the designs a little less crisp than they were originally cut from the steel, yet this didn't stop them. 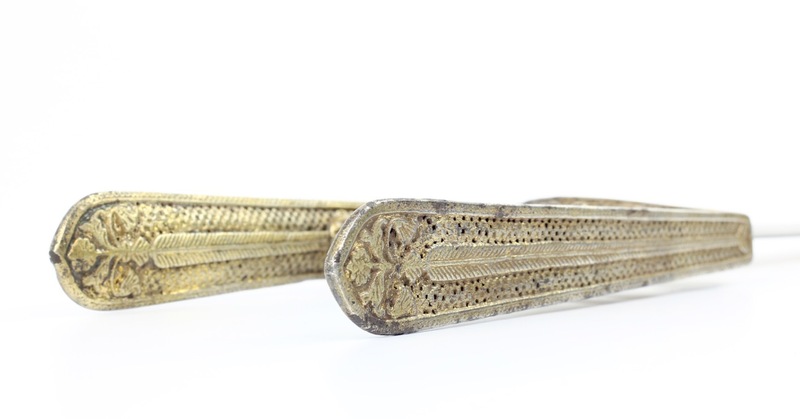 The thick layers of precious metals were probably considered extra luxurious at the time. 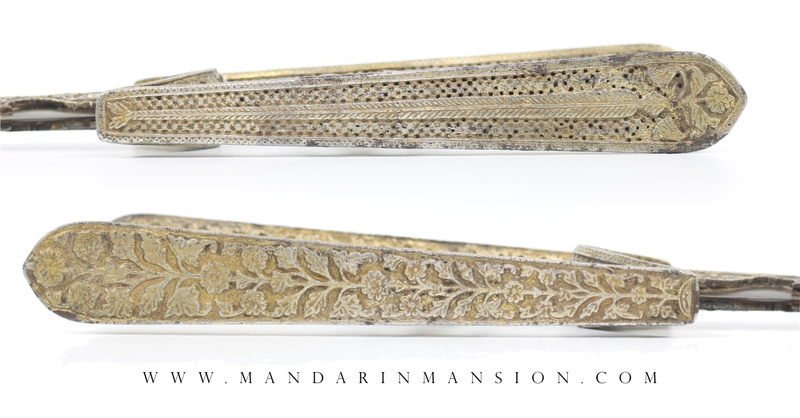 Two katar of somewhat similar overall shape were presented to the Prince of Wales, who was later to become King Edward VII of the United Kingdom, during his visit to India in 1875. Now held at Sandringham.1 They are said to have come from Vizianagram, Madras and date from the 18th century. 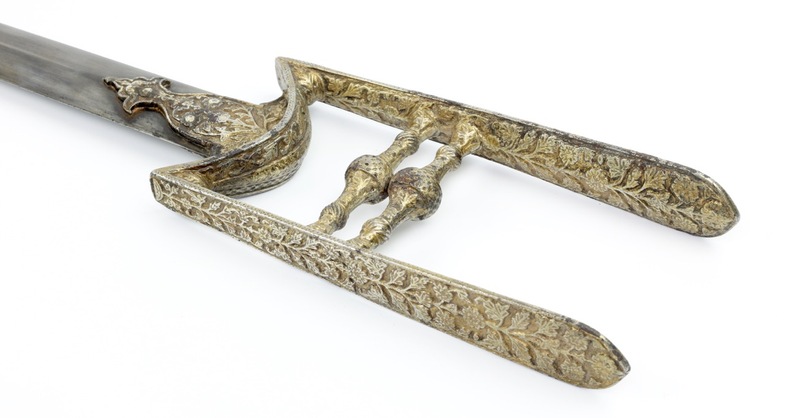 This example has ball-shaped handlebars that are reminiscent of earlier pieces, like those found on 16th century Vijayanagara katar. The overall shape of the handle, combined with this feature make me think it's probably a 17th century piece. 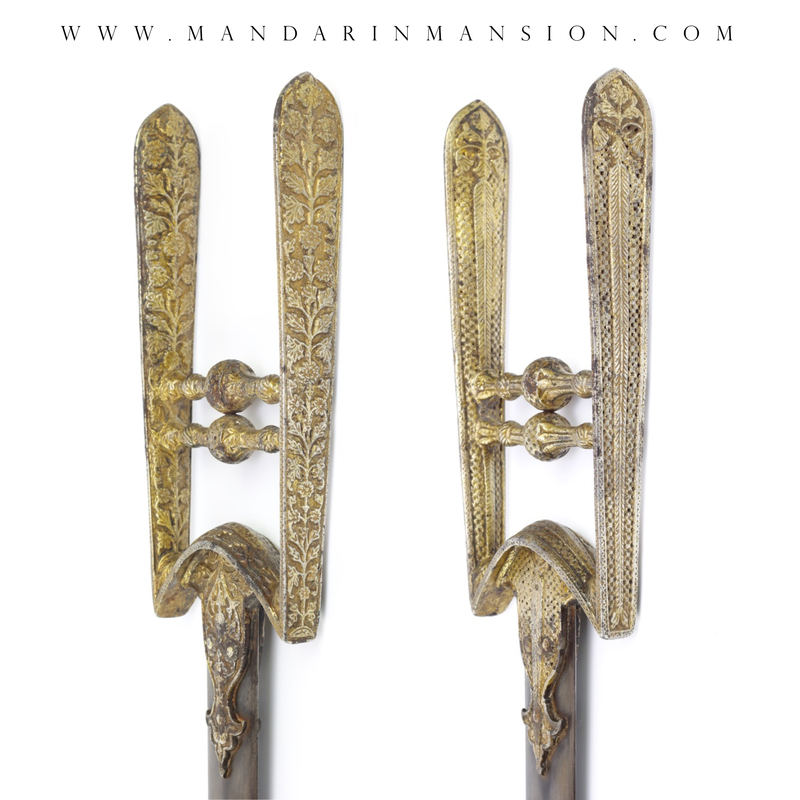 The long blade is double edged, tapering to an acute point. It has a flattened diamond cross-section with center ridge line. In its current condition it shows faint traces of a forge folded construction. 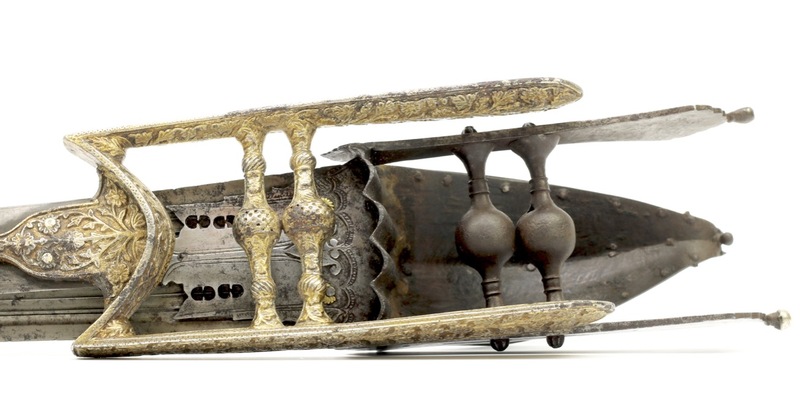 An incredibly rare Indian katar with two very different types of decoration. It is lavishly clad in silver sheet which was subsequently gilt. 1. C. Purdon Clarke; Arms and armour at Sandringham: the Indian collection presented by the princes, chiefs and nobles of India to His Majesty King Edward VII when Prince of Wales, on the occasion of his visit to India in 1875-1876 , W Griggs & Sons, London, 1910. Pages 20-21, catalog numbers 259 - 260.